A recent datamine of Star Wars Battlefront 2 suggests that a new “Titan Mode” is coming to the game. The mode shares a name with a unique mode from DICE‘s Battlefield 2142. The Battlefield 2142 Titan mode played similar to a conquest game, although both teams had massive ships called titans in-game. These ships had their shields slowly whittled away by automated cannons that teams fought for control over. After defeating a titan’s shield, players could enter the enemy team’s titan to destroy it from the inside or continue to deal damage with cannons. The Titan mode in Battlefront 2 likely won’t work exactly the same, although the general framework seems to be similar. Fans and critics enjoyed the Titan mode when Battlefield 2142 released in 2006, although it led to a number of problems for the game, as latency issues sprung up when Titans moved around the battlefield. Many Battlefield fans have been calling for the mode to come back in some fashion, as the mode never jumped to other games. A roadmap for Battlefront 2 updates pegs the mode for February 2019, alongside the release of Anakin Skywalker. 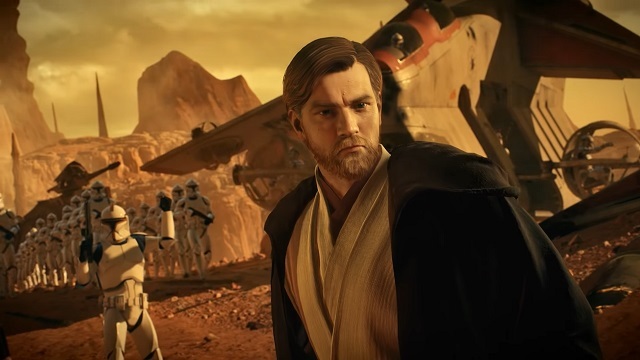 DICE recently released General Grievous, Obi-Wan Kenobi, and a new location set on Geonosis. The Clone Wars season of content is set to bring Count Dooku in January. EA DICE have continued to support the game, bringing major balance patches to the game and altering microtransactions. It’s undoubtedly a better game than it was at launch, but many were too burned by its launch to go back.